The second print in Robert Taylor's 'Remember Pearl Harbor!' pair remembering the Japanese attack on Pearl Harbor, and the events following December 10, 1941. Captain Colin Kelly's 19th Bomb Group B-17C is outnumbered by Japanese Zero's as it returns to Clark Field in the Philippines, December 10, 1941. After completing a successful bombing attack on the Japanese heavy cruiser Ashigara, with his aircraft badly damaged and on fire, Kelly remained at the controls while his crew bailed out. 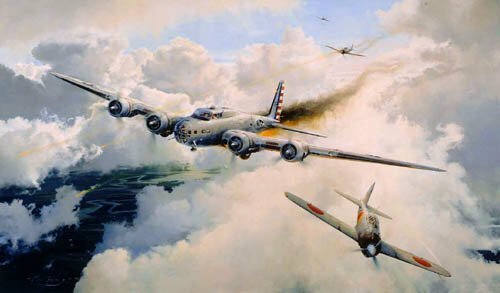 Seconds later the crippled B-17 exploded Colin Kelly became America's first World War II aviation hero, was posthumously awarded the Distinguished Service Cross, and a legend was born. Prints are signed by two surviving members of Captain Colin Kelly's B-17 crew. A matching numbered companion print RISING SUN, signed by legendary Zero fighter Ace Suburo Sakai, is issued fee with each copy of 'The Legend of Colin Kelly'.